Shri Piyush Goyal, Union Minister of State (IC) for power, Coal, New & Renewable Energy has said, 30,000 Megawatt more capacity of Thermal Power has been added during last 20 months of Present Government. Addressing an interactive session organized by Indian Chamber of Commerce in Kolkata today, Shri Goyal Said, Power being the most important ingredient of infrastructure for nation’s development, the government is laying utmost emphasis on this sector. The Minister informed that his ministry has achieved 60% working capacity of power plants and has a target of 90% working capacity which will be achieved in near future. Asserting that India’s Coal production has increased substantially by 9.6% which has resulted in remarkable reduction in our coal imports, the Minister said, his ministry is now emphasizing on creating more marketing facilities for coal. Shri Goyal said, more than 5 crore 36 lakh LED bulbs have been given out at government subsidized rates due to which the rate per bulb has come down from Rs.310 to Rs.64 and within a short time it will come down further to make it affordable for common man. He added that this has resulted in 1600 MW reduction in power consumption and said that by this year March, 10 crore of LED bulbs will be given out. This will result in a huge reduction in power consumption and drastic cut in pollution. Regarding transmission, the Minister said, during the present government 22,000 circuit Kms of transmission line has been drawn which is a record. During last 18 months, 71% of additional transmission capacity has been created and by 2019 it will reach 200%. Saying that in power sector, an well-coordinated and harmonized approach is need of the hour to integrate thermal -- both Coal & Gas – , hydel, solar, wind and other renewable power sources – which are eco-friendly – as well as nuclear, Shri Goyal assured that the govt. is relentlessly working in this direction. The minister said that his dream, and effort is to provide uninterrupted 24 x 7 power at affordable cost. 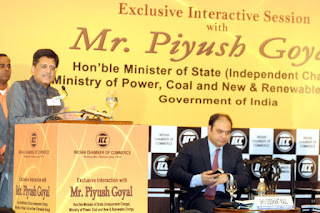 On the Coal sector, Shri Goyal said, open, transparent and competitive auction of Coal mines has not only brought much more revenue to the state exchequer but also has increased the coal production also. Among others, Shri Anil Razdan former Secretary Power also addressed the session.